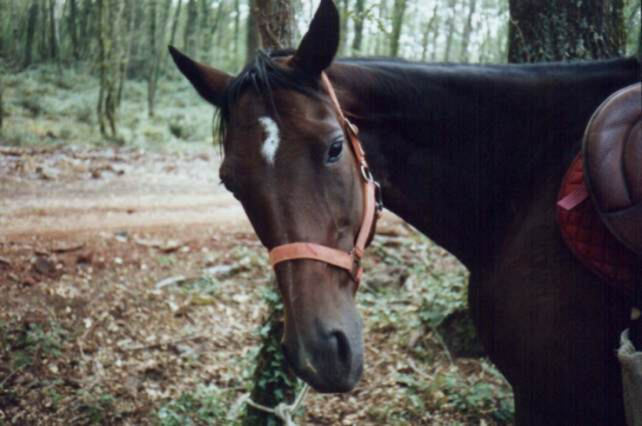 Horseback rides in the Archaeological Park of the Tufo Towns and on the Green Trails of Europe. 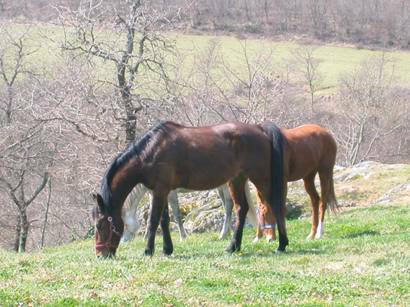 The Belvedere horse-riding centre is in Tuscany, in Grosseto's high Maremma, in The Archaeological Park of Sorano, at only 30 km from Saturnia and at 20 minutes from the lake of Bolsena. 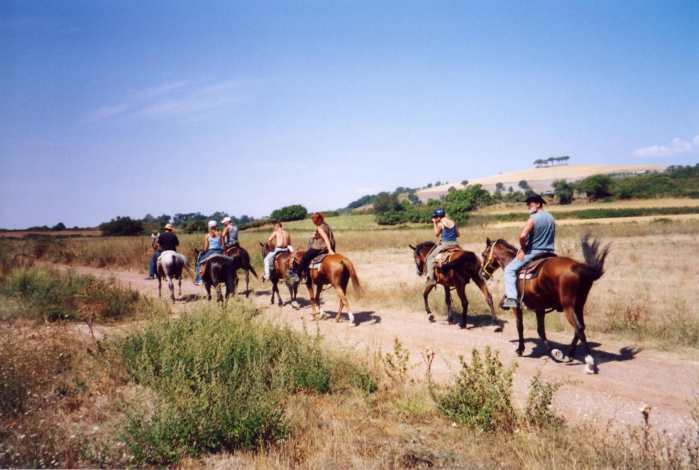 From Filetta, where the horse riding centre is, you can go on horseback excursions of a few hours or of one or more days along the trails of this corner of Maremma. You can visit, on trekkings organised during the weekends, the medieval and Etruscan centres of Sorano, Sovana, Vitozza ( all in the Archaeological Park), and Pitigliano. 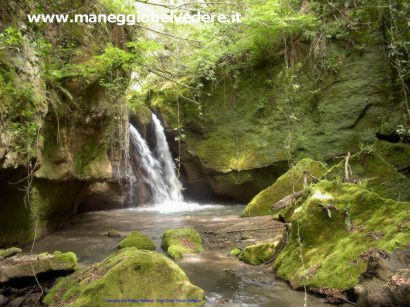 During the 4/5/6 day trekkings it's possible to reach the Mediterranean coast of the Argentario, Saturnia's spa baths, the heart of Maremma (Capalbio and Magliano in Tuscany), the lake of Bolsena and the fascinating Lamone Forest. Sorano: A medieval centre with its stately fortress from which you can dominate the typical sixteen century village, and admire the Masso Leopoldino (a tufa cliff fortified by the Lorena in 1700). 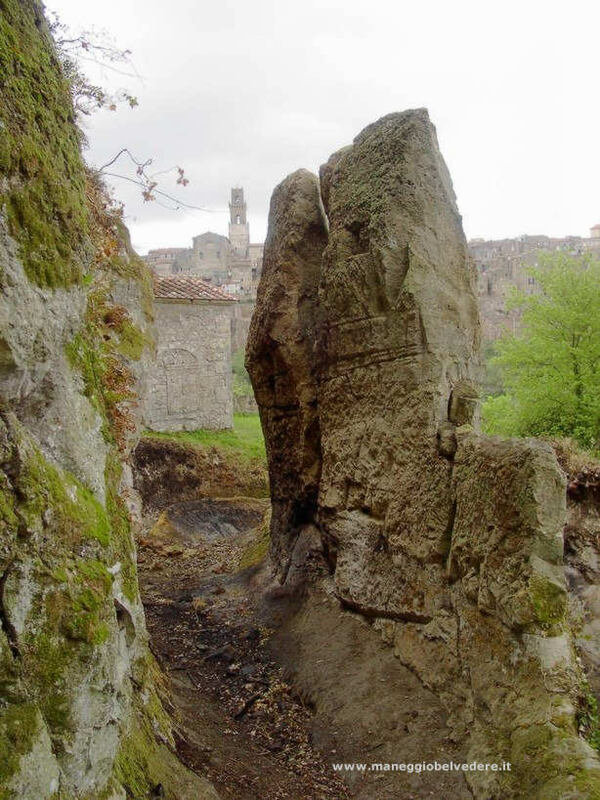 There are several tracks, the ancient Vie Cave, that lead to the near archaeological sites, like San Rocco (an Etruscan necropolis), with its beautiful view of Sorano. * Vitozza: A rocky settling constituted by about 200 caves, inhabited until 1700, with a beautiful roman columbarium and the remains of the walls of the castle and the church. Sovana: It's the pearl of this area. The medieval centre with its buildings by the Aldobrandeschi is unique in its kind and so are the beautiful necropolis and the Vie Cave. Pitigliano: It's a medieval town, with several Vie Cave ( roads excavated in the rock) hundred of metres long and at least ten metres deep: it's an incredible feeling to ride through them on horse back. 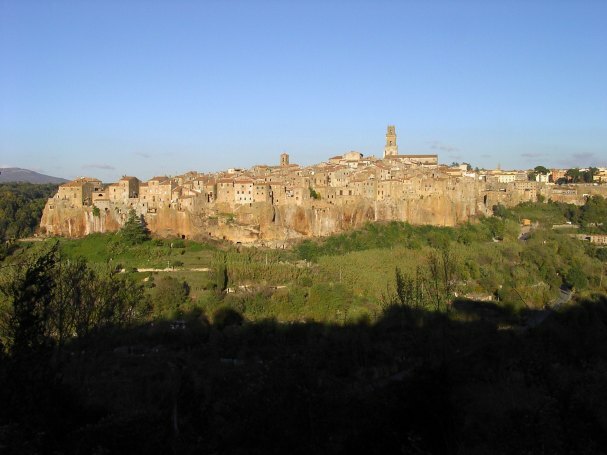 Pitigliano is also called "Little Jerusalem" because Jewish families have lived or visited it for centuries. There is a beautiful Synagogue and a Jewish Cemetery. 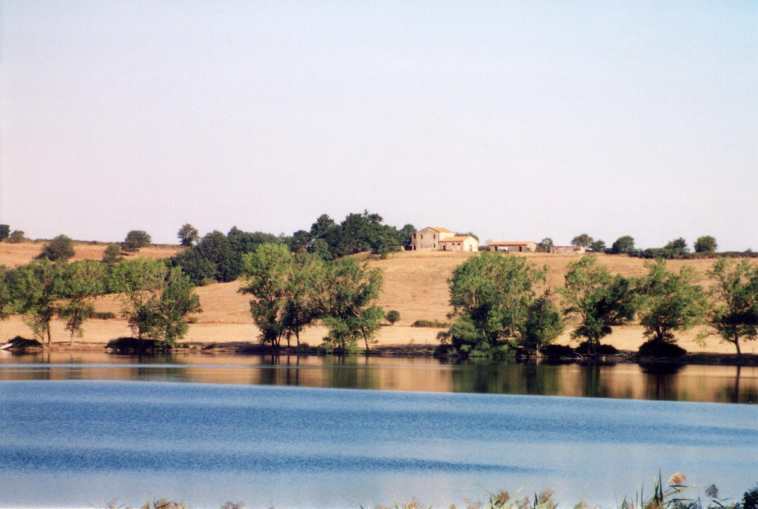 In the area there are other interesting places that can be visited on horseback: Saturnia (Etruscan-Roman settlement, now a famous spa resort), Poggio Buco and Vulci (Etruscan Necropolis); Lamone Forest (archaeological site and fascinating forest); Castellazzara (on the slopes of the Amiata mountain with its typical vegetation); Capalbio (important centre of Maremma); the source of the Nova (luxuriant spring and archaeological centre). Those that have never been horse-riding before can start following a course for learners, organised periodically by the Belvedere Horse-Riding Centre. full board from lunch on the first day to lunch on the last. 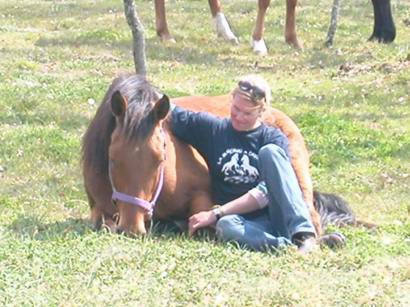 We do stable services, for short or long periods, and colt training. In the Village of Pitigliano it's possible to rent an apartment, even for short periods, finely restored and furnished with antiques, right under the Vier Cave Etrusche, with a beautiful view over the Lente river. It is a typical building of medieval architecture. It is ideal for 4 people. On request we can send photographs of the apartment to prove that it's really special. From Rome the best way is through Viterbo, then towards the Lake of Bolsena until Valentano where you will find the indications for Pitigliano and Sorano; or you can follow the SS1 Aurelia up to Montalto di Castro, turn for Canino, Valentano and Sorano. 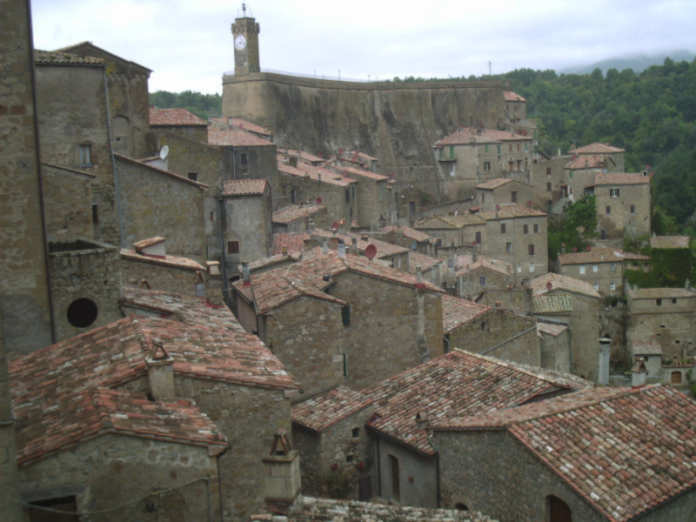 To get to Sorano from Florence you can take the A1 motorway until Orvieto, then direction Castel Giorgio, Grotte di Castro, Pitigliano, Sorano. From Genova take the SS1 Aurelia until Albinia (which is at about 50 km after Grosseto), and then follow the indications for Pitigliano - Sorano.